As a part of the training program, conservators of the Grand Egyptian Museum were sent to participate in three training courses in Japan this year. The training courses were held mainly in the National Institute for Cultural Studies in Ueno,Tokyo. In the first course, the conservators were trained on the methods of textile conservation (advanced level), which started in July for two months during 2009. The second course, which continued for three weeks during August and September in the same year, was to train conservators on how to use analysis devices for conservation. In the third course, they were trained for two weeks of September and October on the skills of packing and transferring artifacts. After their return to Egypt in October, brief lectures were held to report on these courses. Ms. Venice Ibrahim and Ms. Dalia Ali gave their presentation on the courses they participated in and the time they spent in Japan. 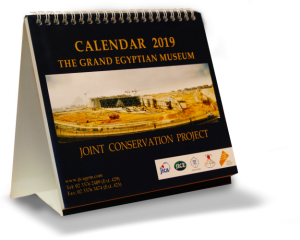 The number of the attendance reached approximately 50, including Doctor Nadia Lokma, the supervisor of the conservation unit, the staff of the project, the conservators of the Supreme Council of Antiquities and other media figures. During the discussion, there was a question on how much the two trainees can apply in Egypt what they have learned in Japan. They answered that they can use almost 80% in Egypt, and then they introduced one of the simple devices that is used in Japan to know color change in the fabric as an example. Another Lecture was held on 22nd of October on the analysis devices training. Mr. Tharwat Muhammad and Ms. Dina Muhammad took this course, and Ms. Dina gave the lecture. She gave an overview of the devices which everybody was interested in and they wanted to be a practical training on how to use these devices the next time. Ms. Dina talked about her experience in Japan and the differences between the two cultures, in addition to the main training issues. For example, she mentioned that not only the excellent work skills of the Japanese people was impressive, but also their cooperation in work. On 29th of October 2009, the seven conservators who attended the packing and transportation course gave their lectures. Mr. Sami Gerges, as a representative, gave a detailed presentation on the training with various footages. The seven conservators are working with the ADD staff in many artifacts storerooms on packing selected artifacts to be transported to the Grand Egyptian Museum. They reported that this course came on time; especially theories on the tracking system and storerooms management. Though the courses lasted only for two weeks, they learned some Japanese vocabulary like万が一」(mangaichi) which means one in a thousand, and they learned a careful attitude in the transportation process.